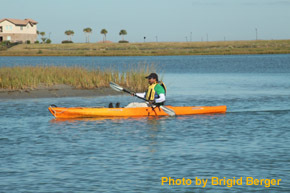 The Port O'Connor Paddling Trail consists of six shorter trails along 40 miles of trail. 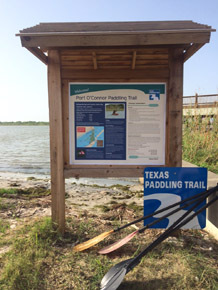 The Port O'Connor Paddling Trail consists of a series of six interconnecting trails navigating 40 miles of trail along the shores of Espiritu Santo and Matagorda Bays and through their boundary saltwater marsh Mules Slough/Fish Pond. The Trail offers opportunities to paddle several hours, all day, or several days as well as opportunities to bird, fish and relax. 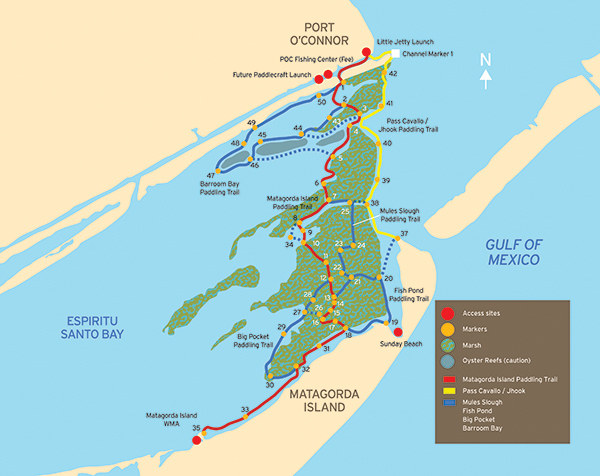 The main spine trail, called the Matagorda Island Trail terminates near the picnic area on Matagorda Island that is managed by Texas Parks and Wildlife Department as a Wildlife Management Area. The Little Jetties site is located on public right of way where Washington Street dead-ends into the Gulf Intracoastal Waterway. A small parking lot is available. The closest public restroom is located at Kingfisher Park on Park Street. Continue east on Hwy 185 / Adams Street to S 2nd Street. Hwy 185 turns right at S 2nd Street; make the turn right. Continue on Hwy 185 / S 2nd Street for 4 blocks. The Little Jetties put-in is at the intersection of Commerce Street and Washington Street and the Gulf Intracoastal Waterway (GIW). The Pass Cavallo Trail heads east around the south jetty (GIW 1). Marker #1 of the Matagorda Island Trail is 1.1 miles west in the GIW at Fisherman’s Cut. The Fishing Center is a privately owned boat ramp and bait stand offering a ramp and parking. Fishing supplies, snacks and drinks, and ice are available for purchase. A restroom is available in the store. The Fishing Center offers the closest access to Marker #1 at Fisherman's Cut (0.9 miles closer than Little Jetties) which provides access to the 'Back Bay' system. Turn right on S 16th Street (at Speedy Stop Convenience Store). After several blocks, turn left on Maple Street, then right on 15th Street. The Fishing Center is located at the corner of 15th Street, Water Street, and the GIW. To get to Marker #1, paddle across the GIW and enter Fisherman’s Cut. 16th Street dead ends to the Gulf Intracoastal Waterway and offers the closet free launch site to Marker #1 at Fisherman's Cut, providing access to the 'Back Bay' system. Several parking sites are available on the street at the TPWD Coastal Fisheries office (418 S 16th Street). Private property is on the left side of the street. Park in the small area on the right side only. The site has no amenities. When launching be cautious of the concrete rubble both at water’s edge and submerged—it presents a hazard to you and your kayak. It is worth your time to examine the launch from the sea wall near the boat house on the left (east) side to see their location before launching. Turn right at 16th Street --at Speedy Stop Convenience Store. The launch site is four blocks on 16th Street, next to the TPWD Coastal Fisheries office. Marker #1 is about 200 yards east (left) on the GIW in Fishermen’s’ Cut. 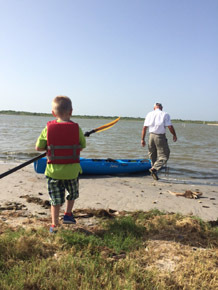 For those paddling the Matagorda Island Trail to the Matagorda Island Wildlife Management Area there is primitive campsite available, but there is no automobile access to Matagorda Island. The paddling trails wind through several bayous and across open water giving you opportunities to paddle several hours, all day, or several days depending on the route you choose. Regardless of your route, the trails are interconnected. The Matagorda Island Trail eventually ends at the campground at Matagorda Island, and because of the distance, a roundtrip to the island in one day is not recommended. Camping is available at the campground. Wear your lifejacket, and take plenty of sunscreen and insect repellant. Plan your trip to make sure you have plenty of water. Watch for faster moving powerboats and oyster reefs that can damage your kayak. Check the tides before you depart, since some trails may not be floatable at low tides, and always know the local weather forecast. Wind is the biggest potential hazard as the trail is subject to periodic strong winds: southerly in the spring and summer and northerly in the winter and spring. The weather can change rapidly, especially from strong northers in Fall through Spring, so pay attention to the forecast. Current tidal conditions and forecasts are available online. Generally speaking, tides above 1’ will allow you to paddle throughout the Paddling Trail, and those below 0.0’ may require you to pull your kayak across occasional shallow spots. The area is also popular with waterfowl hunters. NOTE: Motorboat activity is high on portions of this trail. Use caution at all times, especially between Marker 2 and Marker 3 of the Matagorda Island Trail. 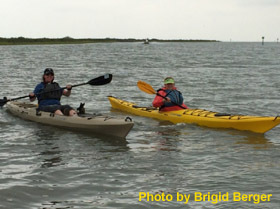 The main paddling trail ends at Matagorda Island. The 56,688-acre island is a Wildlife Management Area that is cooperatively managed by Texas Parks and Wildlife Department and the U.S. Fish and Wildlife Service. The island is approximately 38 miles long and from one to four miles wide. Use of the picnic area near paddling sign #35 is permissible for day-use as long as you stay in the campground area. While there are picnic tables at the site, there is no water or restrooms. If you choose to camp overnight or you want to hike, bike or tour the island for any reason, you must possess either a Limited Public Use Permit or an Annual Public Hunting Permit. The permits can be purchased at any place that sells hunting or fishing licenses. For questions about rules governing use of the island, contact the Texas Parks and Wildlife Department at 979-244-7697. The small islands that border the trail and Matagorda Island support a wide variety of shore and migratory birds and 19 federally listed threatened or endangered species. The small islands that border the trail and Matagorda Island support a wide variety of shorebirds and migratory birds, including pelicans, herons, egrets, Roseate Spoonbills, ducks, Sandhill Cranes, grebes, loons, gulls, terns, willets, curlews, and plovers. The Atlantic bottlenose dolphin is spotted along the trail, and a large heard of whitetail deer can sometimes be seen on Matagorda Island, along with the occasional alligator. The area is known for producing redfish, speckled trout, drum and other popular fish. Trout and large redfish are commonly caught all year long. Port O'Connor, Texas (POC for short) is a small fishing village on the Texas Coast a little more than half-way between Houston and Corpus Christi and south of Victoria. It is often known as the "Best Kept Secret on the Gulf Coast" for its relaxing, laid-back atmosphere, and numerous fishing and boating venues. Port O'Connor Chamber of Commerce website lists places to eat and stay as well as fishing, hunting, and shuttle services: http://portoconnorchamber.com/. Kingfisher Park offers a family friendly sandy beach with picnic facilities, restrooms, a beach shower, and a fishing pier. The park provides access to the beach for swimming, fishing, paddling, and wind surfing. Located at the intersection of Park Avenue and Monroe Street. Boggy Bayou Park offers excellent wade and kayak fishing, paddling and birding opportunities. It is located at the northern end on N 3rd Street at W Taylor Avenue. 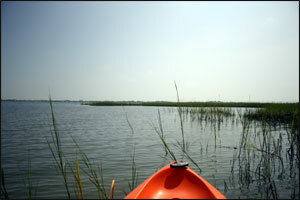 Boggy Bayou provides a shallow and protected lake that is an excellent location for beginning paddlers. Powderhorn Ranch State Park and Wildlife Management Area is coming soon. It includes 17000 acres of undeveloped ranch land with 6 miles of frontage to Matagorda Bay. See: http://tpwd.texas.gov/newsmedia/releases/?req=20140821a. Little Jetties offers excellent fishing and birding. It is located at the corner of S Washington and Commerce Streets. 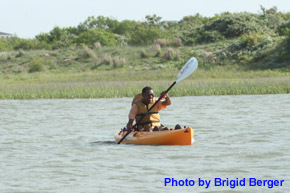 Sunday Beach is located on Matagorda Island and is accessible by private boat or kayak; see paddling trail description. 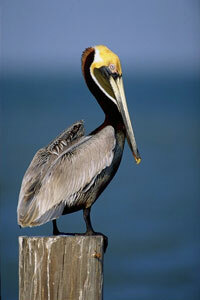 Matagorda Island Wildlife Management Area occupies 7325 acres (29.64 km) on the northeastern end of the island. The remainder of Matagorda Island is devoted to wildlife refuge operated by US Fish and Wildlife as part of the Aransas National Wildlife Refuge. The Refuge, including Matagorda Island, is the winter home of the endangered Whooping Crane. Matagorda Island Lighthouse has been listed in the National Register of Historic Places by the United States Department of The Interior. This trail was made possible through a partnership between Texas Parks and Wildlife Department, POC Chamber of Commerce, Calhoun County, West Side Calhoun County Navigation District, and the San Antonio Bay Partnership. Capt. Jim Reed offers Kayak Transportation, Matagorda Island Shuttles, Bay Fishing Charters, Island Shuttles, Birding; Bay Cruises.